God's Eyes are a common craft in VBS. If you've ever taken Popcicle sticks and wrapped colorful yarn around, you know what I mean. However, many of you probably do not know the origin of where these crafts come from, or what they really mean. Often, the sentiment associated with God's Eyes are something like, "God is always with you, always watching over you, always protects you." The real origin might surprise you. Check it out here. The Huichol, a people group from Western Mexico create God's Eyes to see what is unseen, to understand what has not been understood, and to know what is unknown. 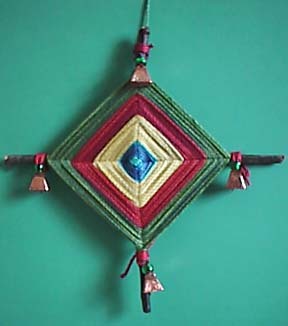 The four colors and the four corners illustrate the four basic elements: air, earth, fire and water. How does this connect with The Packing House novel? You'll have to wait and see for yourself. It's something that connects Joel with Amber. I hope you'll read about it when the novel comes out. I welcome your comments below. And, while you're here, join the blog so you don't miss out on other hints, announcements, contests and tidbits as more information can be shared. Thank you for stopping by! Friday Follow: Great Blogs YOU Should Follow! Meet the Newly Agented Writer, Tymothy Longoria! Rorschach Inkblot Test, Is My MC a Little Crazy?